Learn to do these two first though, and do them well; Then you can change up the ingredients to make just about ANYTHING!! It takes a little practice, paying attention to details and being sure you're using the best tasting ingredients for the recipe - but it's NOT DIFFICULT, I promise. I am leaving a lot of that "taste" factor up to you, because you know what works for your kitchen, ingredients you have available, your taste preferences, your kids taste and texture preferences, and your life!! So we've tackled the basic White Gravy. Here's my take on Brown. One of the secrets to good brown vegan gravy is finding a stock or bullion you really like. Check out your regular grocery store, health-food store, online, whatever is available to you; Read labels, buy stuff, try it, until you find the vegetable-based broth or bullion or stock base that gives the best flavor in your gravy. You may have to experiment a little at first, or actually combine several to get exactly what you're looking for - but that's OK, do what YOU like! I don't like to suggest too many brand-names, because each person's tastes are different, but I know 4764784848 people are gonna ask anyway, and that's OK :), I'll mention some that I like, and are available around here, so they're what I use, if I don't make my own (more on that later): Bill's Best"Beaf", Better Than Bullion "No Beef" Base, and Imagine Foods "Beef-Style" Vegetarian Broth. The following recipe is one I've posted before, but another one of those "basics" I use often - it's a little more involved, time-wise, than the White Gravy, but still simple, and the results are well worth it. 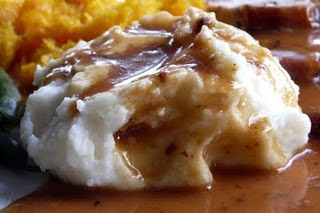 This is a very flavorful "Brown Gravy", the comfort-food stuff my family likes best on mashed potatoes or with meatballs, a lentil loaf, nut burgers or seitan/gluten. STEP 1. Combine first 8* ingredients in a medium saucepan. *NOTE: For even richer flavor, brown the mushrooms and onions in a pan with a little oil first, THEN add to saucepan and continue. The browning step is not necessary but definitely amps up the flavor!! STEP 2. Strain broth mixture through a sieve into a bowl; press vegetables to get all the juice out and then discard solids. (I know, I know!! This step sounds sounds wasteful, but it results in a nice silky-smooth gravy - if you want chunky vegetable gravy just skip the 'straining' step and chop the vegetables finer). Cook 2 minutes or until a bit browned or tannish, stirring constantly (This is your thickener or "roux"). Take off heat and allow to cool a bit. STEP 4. While off the heat, SLOWLY add 1/4 cup broth mixture to roux, little by little; stirring well with a whisk. Slowly add in remaining broth mixture, still stirring well with a whisk. STEP 5. Turn heat back on to medium-high. Adjust seasonings to taste (more salt or pepper maybe?). Serve with potatoes, noodles, dumplings, meatballs, over toast, straight from the pot with a spoon, whatever... YUM. hooorah! thank you thank you for sharing your basic recipes. it's just great. Bookmarked! :) Don't judge me, but I have been using those little instant gravy packets since going vegan, because I didn't know how to make vegan gravy. No more! Yay--brown gravy is better than white gravy, in my opinion (although I certainly wouldn't turn down ANY gravy, lol), and I can't wait to try your version! I am going to have to give this a go. I have been craving lentils and gravy lately(must be the cold weather kicking in). I love the idea of putting Marmite into the gravy, my toddler loves Marmite so we always keep some on hand. i had to make gravy last night from last night's post; i made seitan, biscuits, white gravy & broccoli. now i'm going to have to make this!! sounds delicious!! I salute your gravy challenge! yum! I'm with you about so many restaurants lacking flavor. I rarely go out to eat because of that. a month of gravy? you are my kind of woman. keep it gravy, baby!